This training resource has been called ‘the DVD that every special school should have’ by Graham Firth [UK]. 'Exploring the Envelope' is aimed at practitioners who are already using Intensive Interaction. With an informative commentary written by Mark Barber, the resource examines practices including ‘echoing’, the use of pause and hesitation, sabotage and following the learner’s changes of ‘conversational’ topic. 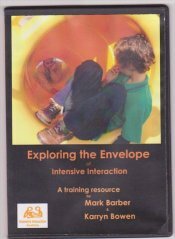 With over a hour of video footage of Intensive Interaction to illustrate a number of topics, the resource is structured around the Intensive Interaction Reflection Tool and is essential viewing for those practitioners who are interested in ‘exploring the envelope’ of interaction with their interactive partners. Although the video is taken in school settings the principles are relevant to interaction with learners of all ages. You can also purchase Dave Hewett’s excellent DVD 'Intensive Interaction', from me for $55+p&p. This is an excellent training DVD with video footage of learners of all ages enjoying interaction introduces the fundamental principles of the approach. With guidance and commentary from Dave Hewett, it is the place to start when you are looking for an explanation and description of the ‘what’ ‘how’ and ‘why’ of the approach.